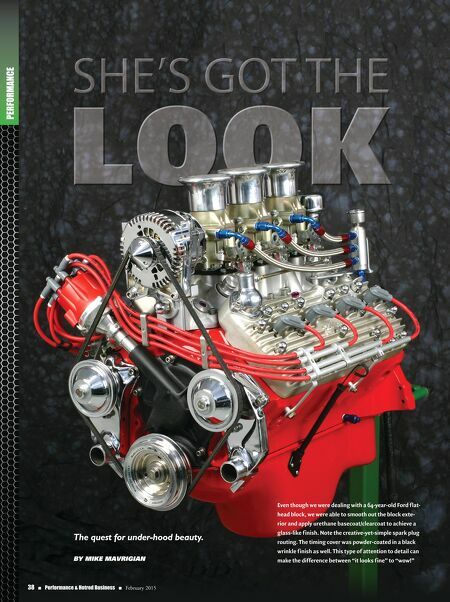 February 2015 n Performance & Hotrod Business n 39 T he old adage of "form follows func- tion" remains true, but let's face it: form is a key element for any restoration or cus- tom mod project. Appearance, and achiev- ing the "wow" factor, is a key ingredient in your business. It may not be the only goal, but it's damned important. Beyond the functional aspect of the build, consider the aesthetics, or appear- ance of the finished product. Granted, from an operating standpoint, appear- ance takes a backseat to performance. In racing applications, some folks don't care and others only expect it to look clean and presentable. For street people, it's often a different story. If the engine is part of a restora- tion, it needs to be clean, tidy and freshly painted to replicate the level of detail (or lack thereof ) of what the factory did. When we consider the appearance of an engine, so much more is possible beyond simply rattle-can spraying the block and slapping on a few chrome goodies. In this article, we'll address a variety of appearance treatments, including: • Surface prep and painting • Anodizing • Powder-coating • Hydrographics • Ceramic coating (We're not addressing chrome plating here, as it really deserves its own dedicated article.) Engine Block Prep & Paint The foundation of the engine is the block. Unless the engine build must adhere to a factory-original level of appearance where the block casting was simply coated with paint without attention to surface fin- ish, the door is wide open in terms of the level of detail. If we don't need to replicate the original finish, we can go hog-wild and address the block exterior as we would the vehicle body. 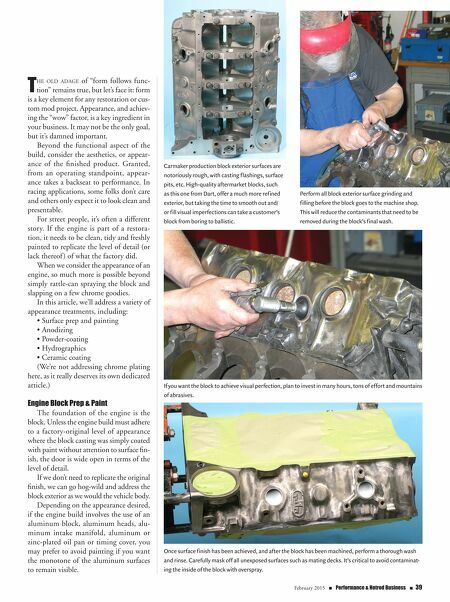 Depending on the appearance desired, if the engine build involves the use of an aluminum block, aluminum heads, alu- minum intake manifold, aluminum or zinc-plated oil pan or timing cover, you may prefer to avoid painting if you want the monotone of the aluminum surfaces to remain visible. Carmaker production block exterior surfaces are notoriously rough, with casting flashings, surface pits, etc. High-quality aftermarket blocks, such as this one from Dart, offer a much more refined exterior, but taking the time to smooth out and/ or fill visual imperfections can take a customer's block from boring to ballistic. Perform all block exterior surface grinding and filling before the block goes to the machine shop. This will reduce the contaminants that need to be removed during the block's final wash. If you want the block to achieve visual perfection, plan to invest in many hours, tons of effort and mountains of abrasives. Once surface finish has been achieved, and after the block has been machined, perform a thorough wash and rinse. Carefully mask off all unexposed surfaces such as mating decks. It's critical to avoid contaminat- ing the inside of the block with overspray.